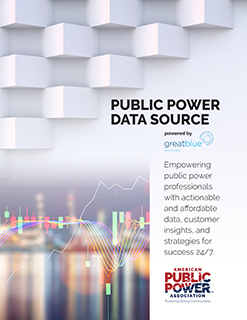 The Public Power Data Source gives you 24/7 access to current trends, topics, and issues that impact the vital work you do. As a subscriber to this powerful online tool, you’ll help to determine the content of quarterly surveys that capture national and regional feedback from thousands of public power customers. Whether you serve 2,000 customers or 200,000, you’ll discover what customers think, so you can provide the services they want. With 24/7 access, you view quarterly deliverables at your convenience. The Public Power Data Source simplifies the reporting process with an easy-to-navigate, highly intuitive dashboard, executive summaries, and downloadable reports you can segment regionally, nationally, and demographically. Purchase subscriptions for your member utilities. They’ll receive access for five of their employees, and you’ll receive access for five of your employees. Contact Products@PublicPower.org to start your subscriptions. This product is available online only to public power systems. If you are a joint action agency or state/regional association, please contact Products@PublicPower.org or call 202-467-2926 for pricing.